How Events work with Delegates? How to use Events with Delegates? When you click with the mouse – It is mouse click events. When you move mouse cursor – It is mouse hover events etc. So when you take any action like a key press, mouse movements, clicks etc an event raised. Let me clear more about it. For example, you filled an online form and click on submit button. In the background button_click() event raised. This event calls and execute an associated function Submit_Click(). This function processes your request and submits page information to database. Delegates are used to reference a method. An Event is associated with Event Handler using Delegates. When an Event raise, it sends a signal to delegates and delegates executes the right function. There are two parts in any event handling program. One part is Publisher that contains definition of events and delegates and another part is Subscriber that accepts the event and provides an event handler. An Event is created using event keyword. An Event has no return type and it is always void. All events are based on delegates. All the published events must have a listening object. All Events should be defined starting with “On” keyword. Before seeing the programming examples you must know the sequential steps to manipulate events. Step 2: Define an Event with same name of Delegates. Step 3: Define an Event Handler that respond when event raised. Step 4: You must have method ready for delegates. This program simply adds two numbers. Only condition is if the sum of number is odd it fires an event that print a message using delegates. //Delegates calls this method when event raised. See this picture. There is some marking on the code. We will go through the marking and understand the process. ev_OddNumber() event gets executed if the odd number is found. Then finally delegate executes the function. In this chapter you learned what is event programming in C# and how to use it in programming. It is the very basic programming example. You would have noticed that the event didn't return any value to event handler. How it would be nice if event sends the odd number to delegates so delegates could print this number along with message. 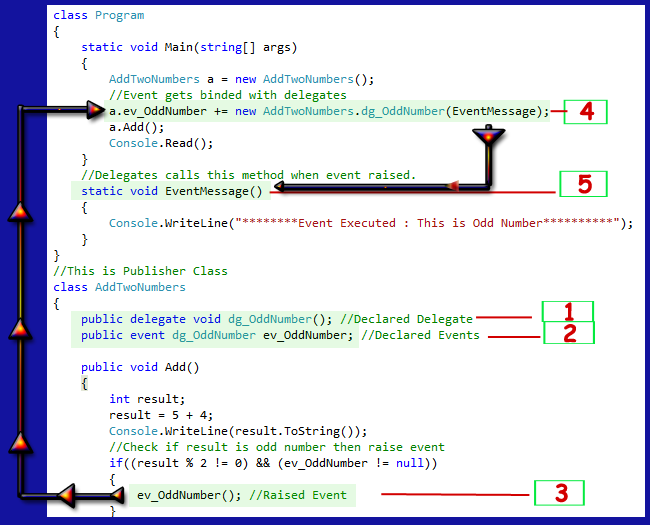 In the next chapter I have added some programming examples that will help you to understand built in delegates and event programming more clearly.